This morning the delivery company had the good mind to give the landline a try and we were going to town anyway and picked them up on the way. So after the jobs in town I came home and did the whole unboxing thing. I had a bit of an advantage in that there were two computers to unbox and set up. Cool, I can make mistakes on the wife’s and mine will be perfect (don’t tell her that). So I unboxed the “ruby red” version that Kate got, set hers up and got onto mine. No major dramas with hers at all. Pictures are good and I took some, check out the whole unboxing there. 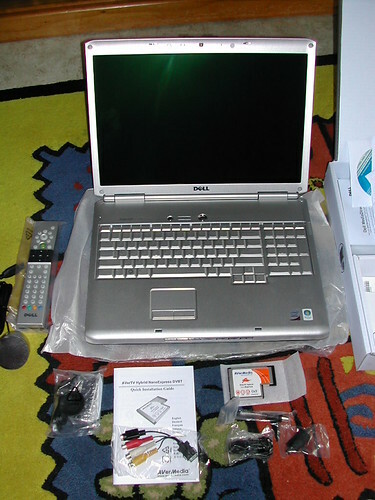 The model that I purchased was a Dell Inspiron 1720, 2.4Ghz processor, 3 Gig of RAM, Audigy soundcard, NVIDIA 256mb 8600M GT video card and TV tuner. That’s the basics of it. I was expecting to have a laptop full of crapware, but to my surprise there was not much at all. The major one being IE and that was gone as quick as I could download Firefox. IE did have Google Toolbar, which is not a big deal. There is a trial of McAffee Security Center installed. Again not a big thing, I am actually giving it a try because it is there, seems to be doing the job and it is not as if it is Norton. 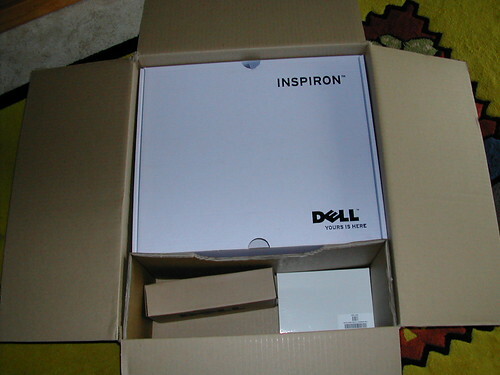 Plus there was the usual stuff from Dell that you might expect and in fact you don’t have that much choice about. Again OK by me and not irreversible. One thing I had to get used to was Vista. Now I feel kinda dirty saying this, but Vista has it’s good ponts. For example connecting wirelessly to the Internet was as easy as pie. The interface is pretty much XP but prettier. But there are some nice gems among the nice graphics. Such as uploading pictures from my camera. Again very easy and straight forward. I really do like the way that Vista handles images, having them sorted into dates and tags turns what used to be a complete mess into something actually useful. I have not found the UAC to be as annoying as I thought it would be either. I have to admit that my bashing of Vista was unwarranted in the generalized fashion that was prone to doing. I said I would never get or use Vista. This time I was not given a choice. I am kinda glad that I had no choice. Sure Vista has issues but so does every operating system, the ones regarding Vista are not as bad as people would have you believe. Sorry but I am yet to find a “puke” factor to Vista. I still might and I’ll be the first to let you know. One peripheral purchase that was a real winner was a Logitech V450 mouse. I still work faster with a mouse and I am using the trackpad as well. But this came in handy when I wanted to feel more at home on the laptop. Setting up was quick and easy, batteries, wireless USB and done in about 1 minute. Only one criticism is the hardness of the scroll wheel button, otherwise a real winner. Well I am going to enjoy the blogging from bed that I will now be able to enjoy. I am pretty satisfied with Dell and the new laptops. More configuring tomorrow, no doubt that will go on for a week or so. Feel free to ask me anything about the laptop or Dell in the comments! The motherboard dying was a no-brainer, new PC. Stupid trying to replace it as the technology has moved on and it was good to get current. The new PC is dual core Intel and is very zippy. Motherboard is a Gigabyte and has all the usual options. Although I lost the AGP slot, which means I had to give up my nVidia 256 graphics card. I am on internal graphics at the moment but I’ll get a card at some point. The RAM is 2 GB of DDR2 and is excellent. Everything loads fast and smooth. Standard DVD, CD drive and covers all the formats you would want. The hard drive is a 320 GB SATA Western Digital. The extra size is very handy and I don’t think that I’ll run out of room any time soon. Tack on an Audigy sound card and a Firewire card and that’s about it. No it is not a high end tricked out gaming machine, but that is not what I do. Plus I like my money in my pocket. One thing that really ticked me off is the fact that the SATA drives do not come with a power cable. It seems that this issue falls into the same category as printers. They can’t decide which manufacturer’s responsibility it is to supply it; the motherboard company, the case company or the hard drive company. Me; I think that if you are forking out a couple of hundred bucks for a drive then they should be dishing out the gear you need to connect it. The USB hub died for no apparent reason. After the build we were plugging in all the hardware and we could smell something electrical burning and pulled everything out. After some sniffing we found that it was the USB hub. Browned off because it was only about six months old! Can’t find the receipt… Got another one. The headphones were on their way out anyway. Decided that since I was spending the college fund I would get a really decent set. I settled on a pair of Sennheiser HD 215’s. Absolutely love them! The sound is awesome and they are light. The cord is a spring type, but the kicker is that it is fully replaceable. I hate the spring type, it gets in the road all the time. Plus I like to be able to walk to the fridge. They cover the ear fully and block out about 80% of normal external sounds. The added comfort of the full ear type will be welcome for those long edits. The phones are not top of the line but I think they are a great middle of the road. Great quality but short of the high end $250+ variety. The microphone thing… well. There was nothing wrong with my Shure PG48, until the youngest child decided to test the limits of the $200 dollar boom arm it is mounted on. He found the limit of the boom arm and the whole shebang went base over apex onto the floor. Don’t worry the fall of the boom was broken by the mic (the mic is actually the cheaper of the two items). The result was that the mic was buggered, it still “worked” but there were issues such as dead spots, muffling and a loss of dynamics. Que the purchase of one brand new mic to replace the one that was not quite 12 months old. To top it all off the printer died tonight, the podcast was not fully uploaded to the FTP server and I am not sure what else can go wrong in actual fact. I know there are things much worse. I would rather not find out what they are. 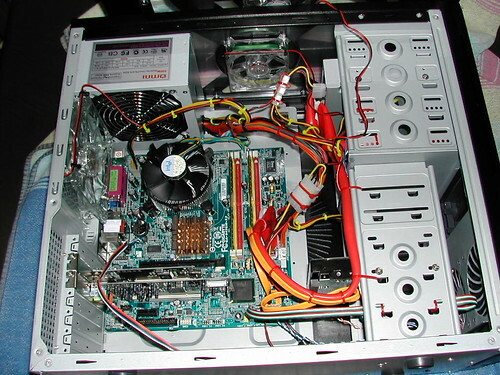 This is a photo of the internals of the new PC. We forgot to take progressive build shots. I spent ages on the cabling as the case has a perspex side and top. But I think the results are worth it. I am an avid reader. I read a book every two weeks or so. I would say that there were people that read more than that but I can only fit that amount of reading in. Originally I was of the opinion that I liked my paper books and that the “feeling” a “real book” could give could not be replicated electronically. But with the up and coming release of the SONY reader I have been reevaluating my opinion. The SONY reader has got me thinking that it might be something I would actually use. I like the concept of having lots of books in the palm of your hand. I also like the idea that multiple formats are supported. But the idea that appeals to me the most is the ability to integrate the on-line experience to make my life easier and more fun. This also means a saving of cash, books are expensive! I also tend to read a lot of fantasy and that means large books, so my bag gets lighter. In addition there is the idea of browsing the shelves in the comfort of your home. But the major drawback for me at this present time is the fact that there is not a huge range of books supported as yet. I have searched for some of my favourite authors and come up with zip. I can also see that authors like Terry Brooks have jumped on board and seem to be supporting the concept. Overwise offerings at this point in time seem to be limited at best. The authors that are on offer seem to be either the most popular or ones looking for any avenue for distribution in order to become known. Considering the demographic of fantasy readers I find this to be quite strange. There would be a large number of geeks among the genre. Especially in science fiction. This state of affairs could be due to the fact that when something is new they direct their marketing at the largest possible user-base and what they know will sell. It makes sense. But then again if that is what the major vendors are offering, it opens up a great opportunity for a niche market to be targeted, if executed properly. So with the SONY offering on the way and the $466 AU price tag or there abouts, I think I need to be a little more convinced that the technology is for me. But not because I don’t like the idea, just the variety on offer. Until there is a much wider variety of offerings I think I will sit out until there are more adopters. Unless anyone knows of great places to buy eBooks, fantasy ones? There is a bit of a story to this picture. This is a sticker on the inside of a writing desk that my mother owns. I think it was in my brother’s room for a while, or it might have been mine. But one of us saw fit to cover this; no doubt, antique with stickers! About two weeks ago I was talking to Dad and he had reason to open the cabinet. You can imagine my surprise when I found this sticker plastered to the inside! I am not sure about the age of this sticker, but I am sure that us boys would have been somewhere between eight and 12. Back then the old Commodore VIC20 was the go. With it’s brute raw power and 20K of memory! Don’t worry we didn’t get the VIC we got the Commodore 64, double the memory man! Now that’s power! We had great fun with the games and the useless tape system that never worked! But then disks came out and that was rad, so we didn’t have to keep count on the tape counter anymore. You know how it goes. But this is where we came from and has lead us in some ways to where we are today. I never dreamed that what we could do now would be possibile then. Maybe my kids will be laughing as hard as I am about what we are using now. As a matter of fact I am sure they will. Enjoy the trip and whatever memories that it causes to surface in you, I did. Yesterday I went back to the store and hunted for another USB hub. I found one. It is pretty basic and the only cool thing about it is that it is aluminium! The only light on it is a red one, at the back to say it is on. Bummer. Yeah sure this one is 2.0 compliant but I can tell you this hub is boring. So I concluded that I want the one with the cool lights without the slow speed! I think also I am more disappointed that the cool lights had to go back and I have a boring alloy Hub. So I like things to look good and be functional, I am disappointed in myself, I always thought that I did not mind what something looked like, as long as it did the job! Seems not.